CMCP-603H High Temp. Accelerometer Extension Cable Reliability Direct, Inc. Your Direct Source for Reliability, Maintenance, Test & Measurement! The CMCP-603 series extension cables are designed to work with all accelerometers using a MIL Spec 5015 2-Pin connector. It utilizes a positive seal "O" ring that mates with the 2-pin connector found on the majority of accelerometers. The connector backshell is fully potted and designed to be water tight. 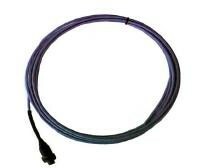 The 20 AWG cable is twisted and shielded to provide EMI and RFI protection. Supplied blunt cut. If lugs or BNC required, please call. Armored Cable is also available as an option.